Imagine a palace filled with wonderful artwork from foreign lands, incredibly detailed and ornate tile work, opulent swimming pools surrounded by graceful figurative sculptures – all placed in the lovely setting of rolling hills stretching down to the Pacific Ocean. It was built in the 1920s-1940s, and is an achievement that will never be equaled, not in this day. If you have been there you already know the place I speak of – Hearst Castle in San Simeon, California. On a recent visit I was floored by the beauty of the residence that William Randolph Hearst created on his family’s 250,000 acre ranch land. There are three tour options in the winter season and I chose to take the tour of the Grand Rooms. The ability to then wander the grounds of the Hearst estate was a real selling point for this artist. After the tour I settled down to draw… more on that challenge later. The tour begins with a bus ride along a curving and scenic road up through brown rolling hills to the estate. Riding the bus is a good entree as you are not forced to look at the road but can fully take in the beauty of the views. There is a recorded introduction to Hearst Castle playing as you ride the bus, but for me the interest lay more in the scenery of rolling brown hills and Coastal Live Oaks, all with a backdrop of the Pacific Ocean. The narrative provides valuable and interesting details, however, and contributes to the growing sense of anticipation and wonder. The bus group is met by a docent as they disembark below the castle and the tour begins. The tour mainly focuses on interpreting the part of the history of the castle that most people want to hear. Visitors seem to be more interested in Hearst and his guests, the exotic animals he imported to the grounds, and in what antics guests participated while staying in the opulent rooms – during the 1930s and 1940s. A student of art and decorative arts will find very little information during the guided tour regarding the collection. There is some information available on the Hearst Castle website however. Without delving into a blow-by-blow of my tour I wish to mention the aspect of the Hearst Castle achievement that most excited and amazed me. It wasn’t that this incredible, large and beautiful place was created in the middle of nowhere along the coast of California. What I found most intriguing was the architect. I grew up in California and heard about the castle for years… I never visited. Had I known that the architect and designer was a woman, Julia Morgan, I may have been drawn there much earlier. Julia Morgan was an extraordinary person – one of the first women to graduate from UC Berkeley, and the first to be admitted and earn a degree from the Ecole Nationale et Speciale des Beaux-Arts in Paris. She opened her architecture firm in 1904 in San Francisco. Hearst hired Morgan to begin work on his estate in San Simeon in 1919. Morgan was the right person for the job. To me, the detail of workmanship, the sturdy quality of the structures (built on the earthquake prone hills of the California coast), and the aesthetic layout speak for themselves. Hearst Castle is extreme in it’s opulence, but is still very pleasing to eye, incorporates lovely natural beauty, and an ergonomic design – before the word was even invented. Morgan created the shangri-la her client wanted, and incorporated the work of very skilled craftsmen who could copy tile work from the 16th century, and panel painting over 200 years old – so convincingly that most of us would not notice the difference. Wondering at the vision of Julia Morgan, and the open-minded nature of her employer I wandered the grounds after my tour looking for something to sketch. I had about two hours until the grounds closed and I would be forced to ride the last bus down. First I sat near the Neptune Pool, inspired by the curving colonnades and graceful sculptural details. I thought I had simplified the scene enough to draw, but after two tries I realized I had to find another spot to capture some of the lovely detail of the buildings or sculpture. 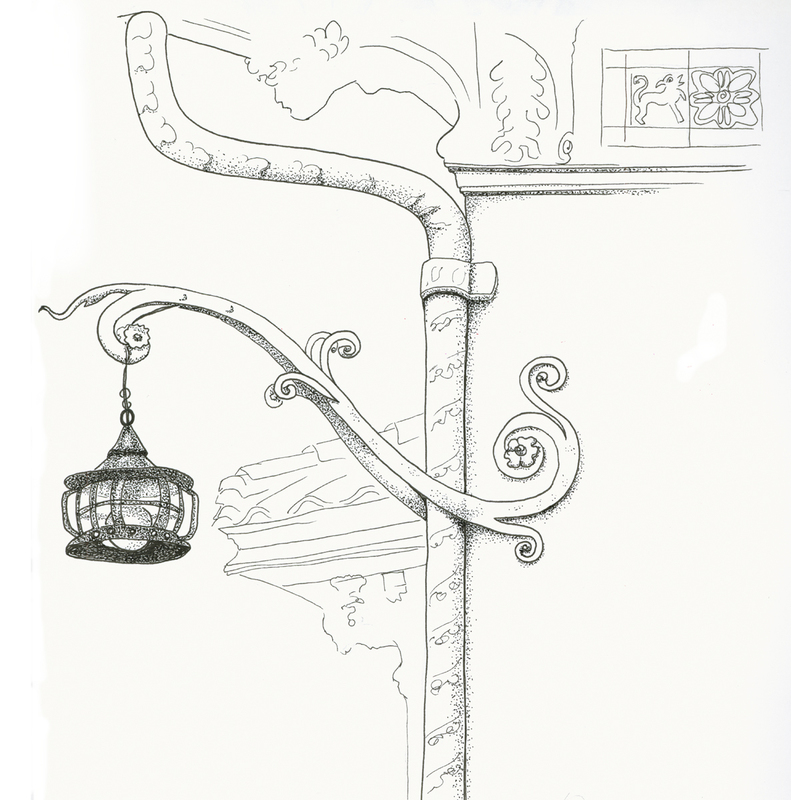 Finally I chose a vantage point beside one of the guest houses and sketched the much smaller detail of the corner of the building and it’s iron lamp and support. The incredible scenery and intensity of detail incorporated in the estate simply overwhelmed me! I had to distill it down into a much smaller focus in order to have the time to commit something to paper! As I was completing the sketch I was finally nudged by security to make my way toward the waiting bus. I barely got to glimpse the amazing indoor Roman Pool just before exiting. The next time I visit Hearst Castle I will go on the first tour in the morning, and stay the entire day to enjoy this magical place!